You hear it everyday, how important education is for our children, but what really inspires them? 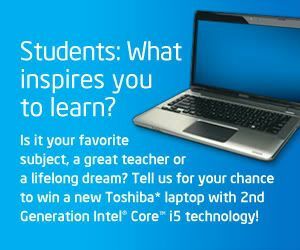 Intel wants to know "What Inspires You to Learn?" In fact, they are holding a contest for students ages 14-18 right now asking them to write about what has inspired them to learn. When I was asked by Intel to answer the question "How do you inspire your children to learn?" I realized that the answer is not the same for each child. It seems that every one of my children has a unique learning style that I must cater to when inspiring and encouraging them to learn. For instance, my oldest is 11 and has a tendency to be lazy and not pay attention to directions. He does really well with a reward/consequence based system. He knows that if his weekly progress report comes home negative, then there will be things taken away. Similarly, he knows that if he works hard for the week, we will do something special together on the weekend. He also really likes to make learning fun, so singing spelling words or times tables has become a favorite for him. Jordan is 9 and has a learning disability, so for him, learning is a difficult chore. To inspire him to learn, you have to cater the experience to the things he likes. He despises reading and is far below his grade level in it, but if you choose a topic he is interested in, it becomes less of a chore. He loves games to, so anytime learning can be made into a game, you have his full attention. My 7 year-old is hyper and has a hard time sitting still and concentrating. Working learning into a physical activity works wonders for his attention span. Sometimes he will learn his weekly spelling words while literally jumping up and down in the middle of the floor. I found that if I can keep his body active, it actually makes his mind more focused on the learning task at hand. Open to students 14 – 18. If student is 14 – 17 years of age, please have parent submit on student’s behalf. Contest is open until August 15. Winners will be announced Sept. 15. Entries will be judged by a panel of Intel and education experts based upon: (1) Relevance to the question, “What inspires you to learn?” (80%), (2) compelling nature of entry, including supplementary materials submitted (20%). Note: the entries will not be made public unless they are selected as one of the finalists. Find a complete list of contest rules here. So, how do you inspire your children to learn? *This post has been funded by Intel, but all thoughts and opinions are entirely my own. My older child learns best with a combination of all the things that help your boys learn. He needs a reward system, the physical activity, and anything we can turn into a game makes it that much less painful. I wish they would have another contest like this. It would be great for Jake.